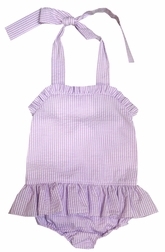 A precious 1 piece swimsuit/bathing suit for little girls by Three Sisters. 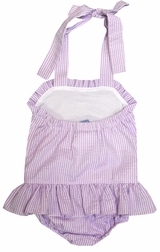 It is made with lavender seersucker and ties at the neck. The bottom of the swimsuit has a skirt/ruffle and the inside of the smaller sizes are lined for modesty and help with "diaper containment"!